Iguazu Falls, Iguazú Falls, Iguassu Falls or Iguaçu Falls are waterfalls of the Iguazu River on the border of Brazilian state Paraná and Argentine province Misiones. The falls divide the river into the upper and lower Iguazu. The Iguazu River rises near the city of Curitiba. It flows through Brazil for most of its course. Below its confluence with the San Antonio River, the Iguazu River forms the boundary between Argentina and Brazil. 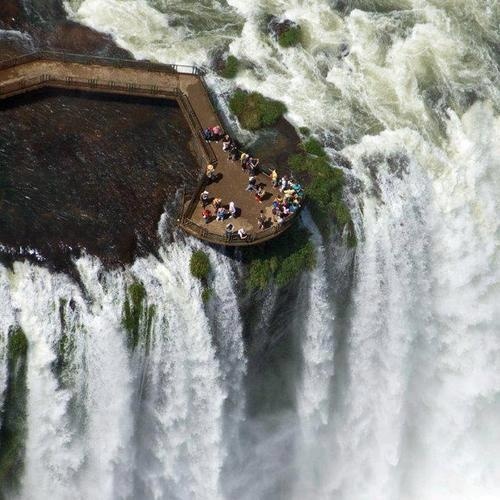 The name "Iguazu" comes from the Guarani or Tupi words "y" [ɨ], meaning "water", and "ûasú "[waˈsu], meaning "big". Legend has it that a god planned to marry a beautiful woman named Naipí, who fled with her mortal lover Tarobá in a canoe. In rage, the god sliced the river, creating the waterfalls and condemning the lovers to an eternal fall. The first European to find the falls was the Spanish conquistador Álvar Núñez Cabeza de Vaca in 1541.